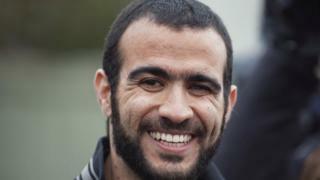 Canada has issued a C$10.5m ($8m; £6m) settlement to former Guantanamo Bay detainee Omar Khadr. The federal government also apologised "for any role Canadian officials may have played in relation to his ordeal abroad and any resulting harm." Canadian-born Khadr, 30, was captured in 2002 in Afghanistan at the age of 15, and spent a decade in Guantanamo. He was convicted in 2010 by a US military commission of killing US Army Sgt Christopher Speer. "We hope that this expression, and the negotiated settlement reached with the Government, will assist him in his efforts to begin a new and hopeful chapter in his life with his fellow Canadians," said Foreign Affairs Minister Chrystia Freeland and the Public Safety Minister Ralph Goodale in a statement. The Liberal government refused to officially disclose the the amount of the legal settlement despite the figure being widely leaked to numerous media outlets. Khadr was suing the government for $20m on claims Ottawa conspired with the US in breaching his constitutional rights. Khadr was the youngest prisoner ever detained at the US military prison in Cuba. He became a cause celebre for opponents of the Guantanamo Bay naval base and his case received international attention. He was convicted of five crimes, including throwing a grenade that killed Speer in 2002. Khadr said his confessions to US officials were made under duress. His detention dragged on during the mandates of three previous governments, both Liberal and Conservative. Canada's Supreme Court twice found that Canada violated Khadr's constitutional rights, holding that Canadian officials had been complicit in Khadr's mistreatment and contributed to his ongoing detention. In 2010, Canada's Supreme Court ruled that he was interrogated under "oppressive circumstances." Mr Goodale said at a news conference on Friday that reaching a settlement "was the only sensible course". On Friday, the Canadian Press wire service reported that the Liberal Trudeau government wanted to get ahead of an attempt by Speer's widow and another US soldier wounded in the 2002 firefight to prevent Khadr from receiving any funds. In 2015, the pair won a $134m (£103m) settlement in a Utah federal court in a lawsuit filed against Khadr. The Globe and Mail reports their lawyer filed a court application in an Ontario Superior Court in Toronto this summer in a bid to block any possible payment to Khadr. Mr Goodale denied any claim the settlement was rushed to block legal attempts to halt the payout by the pair. He said "they will no doubt seek the redress that they think is appropriate and due to them and the legal process will take its course". Khadr was repatriated in 2012 after agreeing to a plea deal to leave Guantanamo and serve the majority of his eight-year sentence in Canada. He was released on bail in Canada in 2015. His case has long divided public opinion in Canada. His defenders describe him as a child soldier. Others argue he was a radicalised fighter at the time of his capture. Khadr was taken to Afghanistan by his father, a member of the al-Qaeda terror network. He spent his childhood in Canada and Pakistan. News that Khadr would be receiving compensation re-ignited the controversy. A petition by low tax advocacy group The Canadian Taxpayers Federation collected over 50,000 signatures in two days opposing any compensation for Khadr. In an interview with the Canadian Broadcasting Corporation released on Friday, Khadr said he was now a different person from the teenager captured in Afghanistan. He said he hoped the "talk about settlement or the apology does not cause people pain and if it does, you know, I'm really sorry for the pain".